Mossberg has been renovating and pushing their shotguns to the next level for years but their latest upgrade is a masterpiece. 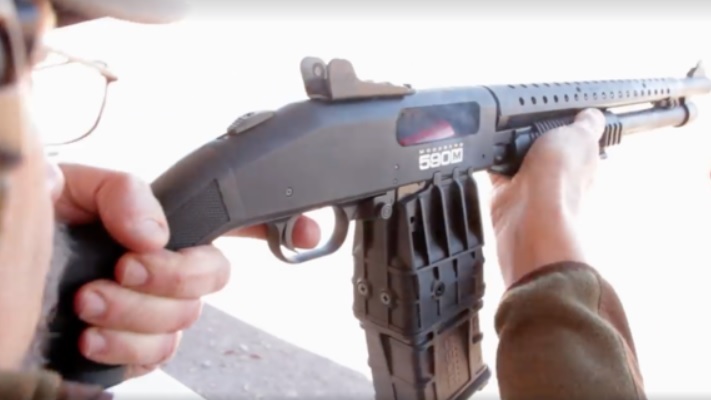 Following the release of Remington's detachable magazine pump shotgun, the 870D, Mossberg has now answered with their own box magazine-fed shotgun and it offers a lot more capacity than its competition. The Mossberg 590M is a 12-gauge that still has that satisfying pump-action but offers the latest in shotgun technology with a 2.75" chamber built on the company's reliable proprietary 590 platform. The 590M uses double-stack detachable box magazines with 5, 10, 15, and 20-round capacities available. The Mossberg 590M is available in two configurations, a stock 590 version which costs $721 and a tactical version complete with a heat shield and rail sections for additional accessories you may want to add later for $801. The 590M's double-stack magazines have a removable floor plate for easy cleaning as well as ASTM-A-228 music wire springs improve feeding, increase durability, and prolong service life. One of the more unique features of the 590M is the non-binding twin action bars. On top of that, the top part of the double box magazines has steel reinforcements. It makes for a much more satisfying feeling compared to trying to lock a polymer mag into a steel mag well. The lock-up of the magazine is probably one of the most impressive aspects of this shotgun, so you get that comforting click that lets you know your magazine is firmly seated. The 590M also comes with an ambidextrous release button which is conveniently located just ahead of the trigger guard making it an easy task to eject with an index finger. The 590 has been around long enough to earn its solid reputation, but is it worth upgrading to the 590M? That really just depends on what kind of a person you are, having a 20 round capacity may be comforting for home defense, or maybe you think having a 20 round pump-action shotgun sounds fun. Either way, the 590M is a sweet shotgun and seems to embody the reliable engineering which has earned Mossberg its solid reputation. The 590M is also almost impossible to jam thanks to its high-quality engineering and steel topped-mags. Mossberg says the magazines have uniquely-designed, integral stabilizing ribs which engage the magazine directly to notches built into the receiver virtually guaranteeing a positive lock-up. Mossberg also put to rest concerns that the mag release could interfere with the cycling action. Naturally, having a double box magazine is going to add some weight but considering it is housed at the gun's center of gravity it makes the shotgun extremely balanced. Mossberg patented the double-stack magazine construction with its reinforced steel feed lips. It also has an over-molded steel shell ramps and an anti-cant, rounded follower which helps it will reliably feed rounds into the chamber. The double-stack design also means greater ammo capacity with even less length than its competitor, the Remington 870DM. Check out the video below to see some live rounds go down range! I like the idea of gun reviews on TGW. Well done!